As you can see in the above image, I'm attempting to render just a part of an animated sequence starting from the frame 1320 to 2056, (indicated into the red rectangle at the extreme right of the image itself). 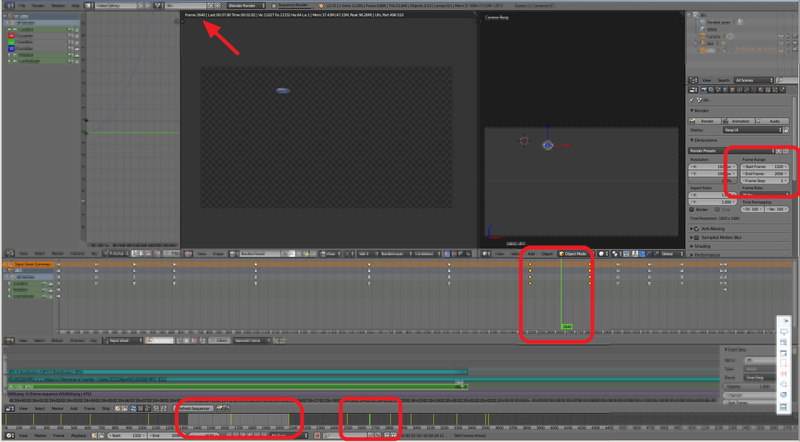 But as you can see at the top of the image, indicated by the red arrow, Blender seems to choice itself what frame render and it is rendering the frame 2640, that is completely out of the range I set. This is happening when I don't start rendering the scene from the beginning of the animation (0-1 frame) but from somewhere in the middle (1320-2056 in this case). I tried as well to create a new blend file and import my animation, the video background, and audios and it still goes happening: blender seems to ignore my settings. 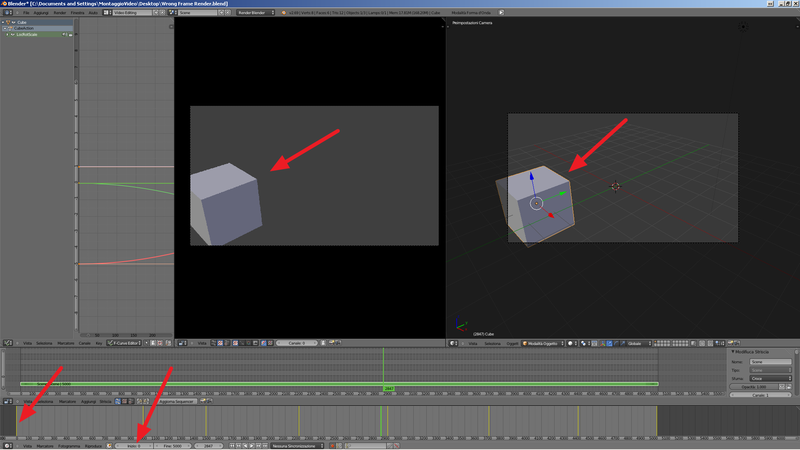 But if I start rendering my scene from start (0 or 1 frame) Blender behaves OK and does the job correctly as requested. 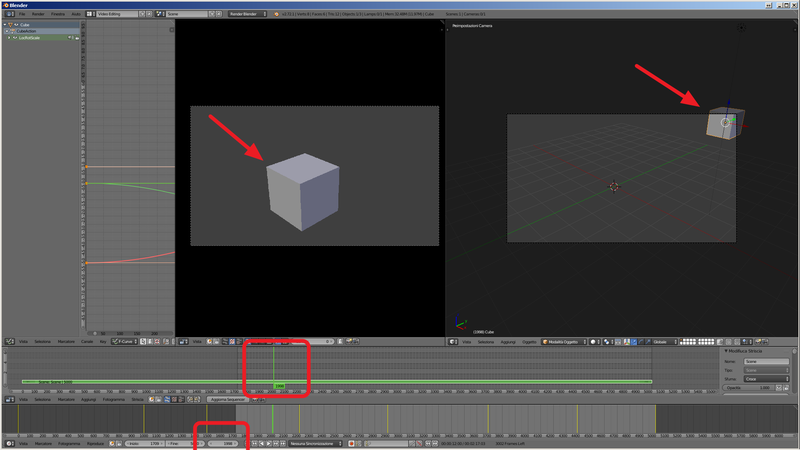 indicated by the red arrow, the position of the cube is not synchronized between the Video sequence editor view and the 3D view, so is the rendered image as well. in my case updating the sequencer doesn't solve the issue. Another more thing: the rendered image is that one showed into the sequence but the correct position of the cube is that of the 3d view. It seems to be due to some kind of sync discrepancy from 3D view and Video Sequence Editor and Render Result. Everything reported above seems a weird behavior due to the same cause and I thought to report it, because I suppose the views have to stay synchronised in every situation. Why blender loses the sync? Is there any setting I can set to solve the issue or it is some kind of bug? Sorry, if I'm doing something wrong (i'm just a newbie in blender environment) but, I'm going mad for that and I cannot figure out what happens and why it has to. One more thing: bigger the start frame value is, greater is the desynchronization. Antony, think this is for you? Bastien Montagne (mont29) added a project: Video Sequencer. This is one of the most bizarre behaviours I have ever seen...but, the thing is the behaviour is technically speaking, correct. Since the scene and sequencer share the same starting frame (Yet Another Design Failure of the Sequencer), scene strips will begin playback at the start frame, which means that the start of the data in your scene strip should always be coincident with the start frame of your sequence. If the sequencer had a different starting frame than the scene, then we would just get the starting frame of the scene at the beginning of the strip. For previewing you can just use a preview range (P key) but for rendering there is no real workaround. To properly fix this we really need to change the way the sequencer interacts with scenes and this is more a TODO rather than a quick fix.